During his recently completed visit to Kampala, Uganda, His Holiness Dr Syedna Mufaddal SaifuddinTUS inaugurated a newly constructed masjid and buildings complex in the Muyenga area of the City of Seven Hills; a hillside location offering breathtaking views of Lake Victoria. During the visit, Syedna and a delegation of some 60 businesspeople and entrepreneurs called on the President of Uganda, His Excellency Yoweri Museveni at State House, Entebbe. The President, in his address, thanked His Holiness and the community for their commitment to Uganda, commending their emphasis on business and contribution to the nation’s social and economic development. Wherever they live, Bohras are identified with their strong roots in trade and business, with the word ‘bohra’ said to have been derived from the Gujarati word for ‘trade’. 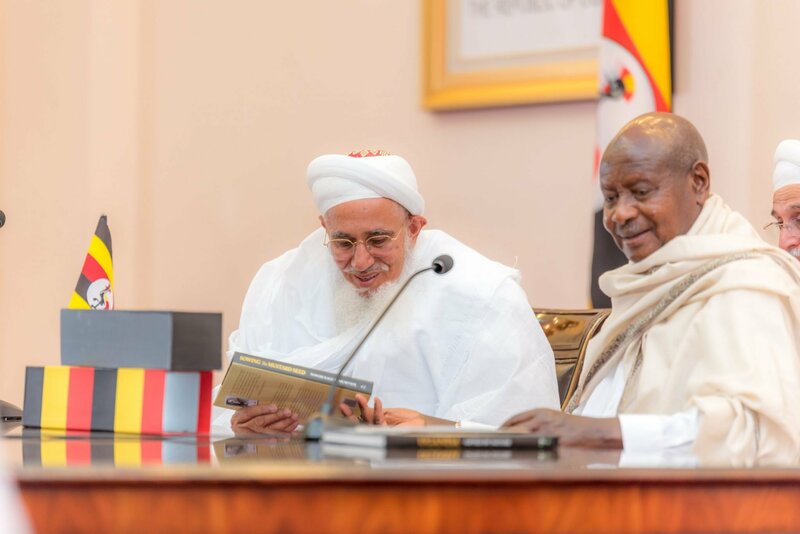 In recent years, at the behest and instruction of His Holiness, many Dawoodi Bohra families from different parts of the world have moved to Uganda to setup business and industries. In just a few years, a community of approximately 100 households is now thriving in one of East Africa’s fastest growing economies. Wherever you may reside, remain loyal to your country of residence and contribute to its development. Abide by its laws and ensure that order is maintained. Make sure that you do not violate these laws, not even in the slightest degree. Do not – even for an instance – contemplate even the most trivial of infractions no matter how much you believe you may stand to gain from it. Remember; Allah is the Provider of livelihood. Such breaches may begin minorly but will eventually transgress to something much larger and more detrimental. I know that you all diligently observe the laws of the land, but I counsel you to remain so. It is in abiding by the laws and statutes of the countries we live in that we find peace and comfort. In all your business dealings adhere to the tenets of Islam, especially when it comes to the prohibition against interest. Do not think that taking a loan from a bank will be the solution to your problems. Instead you will end up facing even more difficulties and find yourself mired in the pits of interest. Never attempt to cheat or deceive anyone, showing them goods that appear to be of a certain quality on the surface beneath which lies worthless sand, especially when it comes to pulses and grains. My counsel to you is stock the best quality of goods. We are members of the Dawoodi Bohra Community, our business ethics and trade practices should be exemplary. If you are in possession of sub-standard goods, then you should be aware of this, and when a customer comes to purchase them you should point out the defects and allow them the choice of making the purchase or not. May Allah keep all of you safe and prosperous. May He grace you with His blessings. His Holiness departed Kampala on Friday evening for Cairo with a short layover in Addis Ababa.